We recently stayed overnight in London as we were travelling to Paris on the Eurostar very early the next morning and I really detest having to get up at the crack of dawn when I don’t have to. As excited as I was at our Paris trip, I am sure fellow Geocachers will understand my thrill when I spotted how close our hotel was to a few caches. My hopes were dimmed on leaving Camberley at lunchtime though as the weather was horrendous with rain lashing down and a hoolie blowing (as Cockrobbinn would say) but as we approached Waterloo the grey ominous clouds miraculously cleared and the sun broke through. A good omen I hoped. I was more impressed with row upon row of cupboards and drawers; and I was delighted to find our very own espresso machine and plenty of coffee pods, kettle, teapot, little kilner jars full of exciting and exotic loose tea leaves (none of those ghastly teabags I dislike so much) and a fully-stocked fridge that even the most discerning drinker would enjoy. As an extra, all the milk and bottled water was free. Cockrobbin and I quickly deposited our suitcases and made our way outside as we were extremely excited to find that our very first Earthcache was close by at the British Library. 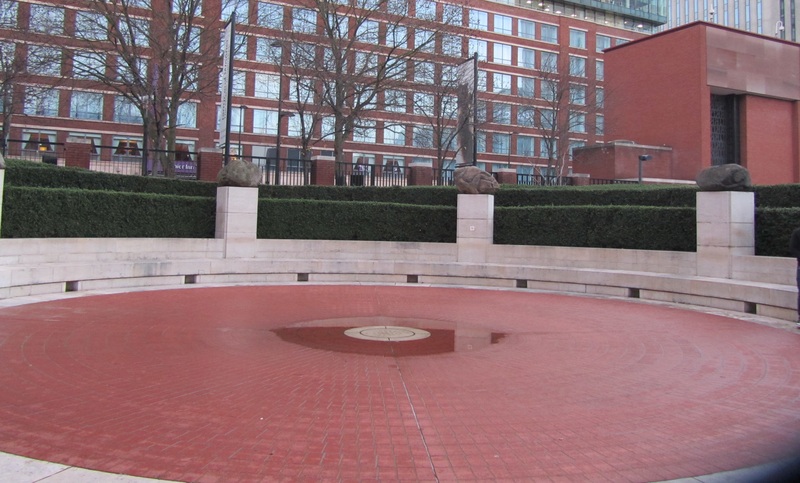 Set in one of the busiest parts of London, An Eye for The Planets (GC5FMC4) is like the eye in the middle of a storm; eerily quiet, no Muggles and the sun peeping through from the clouds. Perhaps we were just lucky, but how lovely to find this place. After the dreadfully wet morning, we were so lucky with the weather and were able to sit quietly here and enjoy the surroundings. It was unbelievable that only a few feet away everyone was risking life and limb on one of London’s busiest roads so a big thank-you to Heidi Seekers for setting this cache. 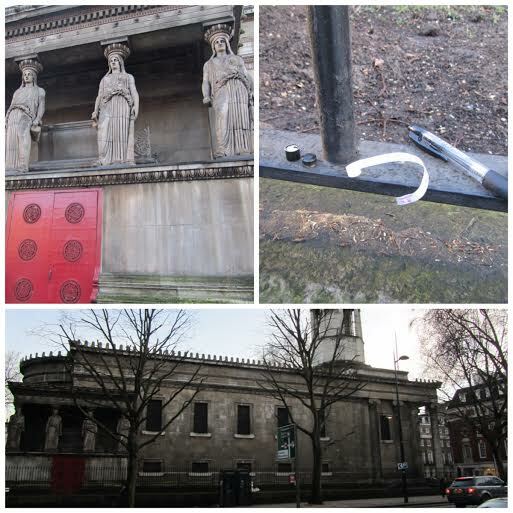 We decided to move on as the next cache was only a couple of hundred metres away; called Maidens Without Midriffs (GC2RR0W) these Coade Stone Caryatids are at St. Pancras Church and the cache (as of 12th November 2014) was the 68th most logged cache in the UK so we really wanted to find it. On checking this more recently, it has moved to the 64th most logged cache in the UK (as of 10th January 2015). Our signal was jumping all over the place when we got nearby but the Amy Winehouse hint really gave us the clue we needed as to where to look. RIP Amy. Although we saw the cache fairly quickly it was quite difficult with all the Muggles about but we managed and turned toward Euston Station where the next cache lay. Cockrobbinn very kindly replaced all the cardboard boxes stored nearby which appear to be used for overnight sleeping! I could have spent hours at Euston Station (we did stop for a coffee) as it is so typically a British railway station and I love people-watching. 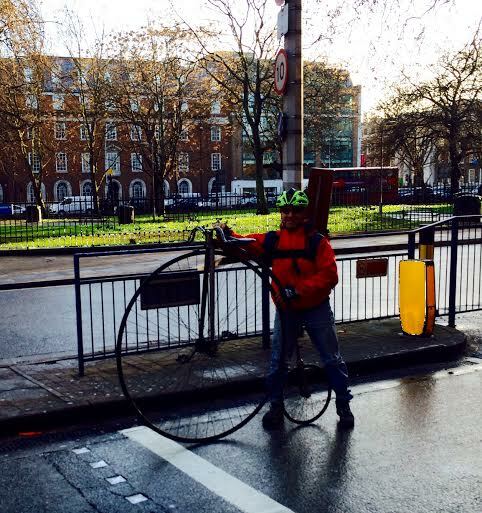 Where else could I nearly get run down by a chap on a penny-farthing !! I would hesitate to drive around London let alone ride on a bike ! The cache at Euston Station Entrance Lodge and Arch proved a quick find but again loads of Muggles about and I carefully rehid the container whilst Cockrobbin hid me from view. We were really looking forward to our last cache of the day (unfortunately not enough time for more) but it proved to be our only DNF. 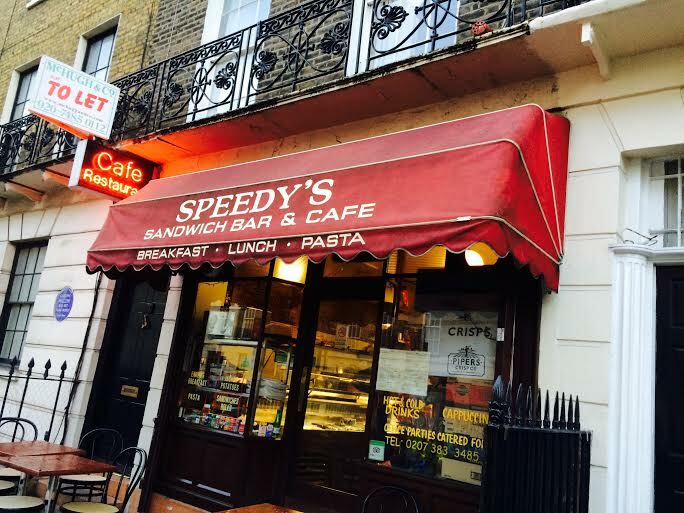 Speedy’s Secret cache was at a location which featured in the smash-hit BBC1 drama Sherlock. Close to London’s Euston Station, the BBC turned the busy location in to 221B Baker Street, home to Sherlock Holmes (Benedict Cumberbatch) and Dr. Watson (Martin Freeman) and of course Mrs. Hudson (Una Stubbs). As it had become the must see destination of many Holmes and Watson fans from around the world, we were looking forward to this little bit of screen trivia. But it was not to be…………. We found the area easily and possibly where the cache should be, but all we could find was an empty magnetic container (broken) and we are not really sure if that was the right one. We may have been looking in the wrong place but the light was going and we decided to head back to our hotel for a freshen up and an evening meal. So a bit of a disappointment to end on but nevermind, tomorrow is another day. 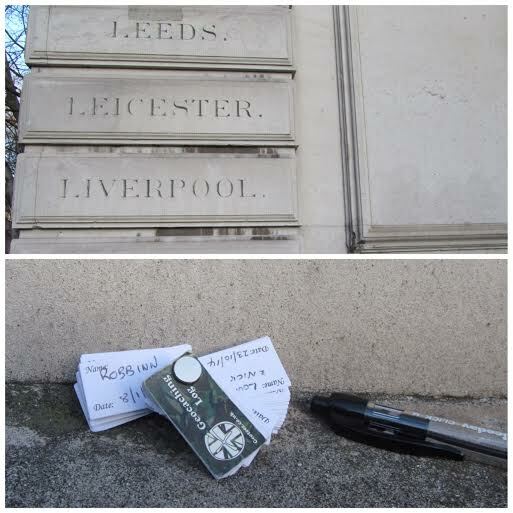 This entry was posted in Cache, Euston, Geocaching, London, St. Pancras and tagged Euston Station, London. Bookmark the permalink. I remember that maidens with no midriffs cache and the arch at Euston very well. The maidens one is actually a really interesting story behind why those statues have reduced tummies. 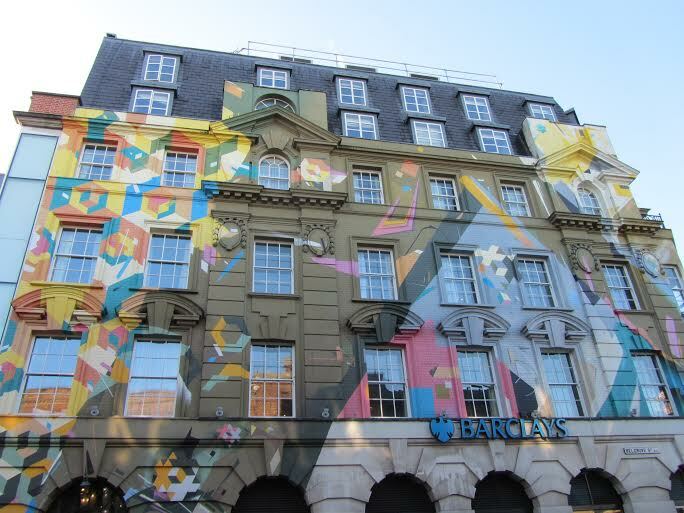 Shame you were short of time because our all time favourite cache is the British Library Multi which is so much fun and was so close.. If the weather had stayed bad we were going to try the British Library Multi; it would have been our first multi (still feel quite new to Geocaching!). It’s on our list of to-do’s for in the future. It sounds like you had a great adventure! I really did not use my time in London to the best, sadly. There are so many great caches in the area!